We are so excited for the new season starting in just less than three months! It seems like a long way away but it’s going to come up fast. We officially begin patrols during March but we are hoping that the turtles will start nesting in February. Nesting levels in February and March will give us an indication of how well the season will go, in terms of numbers of nesting females. This past two years has been exceptionally quiet with only 48 individual turtles in 2016 and 28 in 2017. This is far below the record of 202 turtles during the 2009 season. 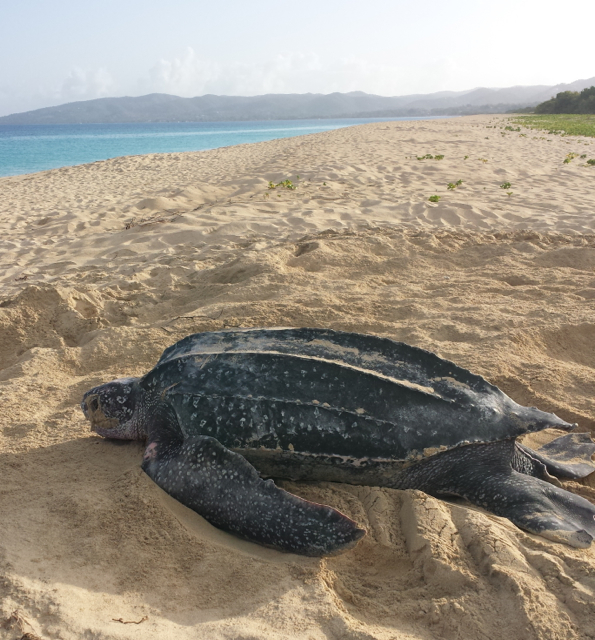 The low seasons we have seen recently are mirrored in other nesting locations, so we are not concerned that it’s something happening only in St. Croix – but Caribbean-wide. The most likely explanation is that turtles are having a harder time finding food (jellyfish) and then taking longer to return to nest – they usually nest every two or three years. When food resources are low, turtles may take four or five years to return to nest. Only time will tell, but we are keeping an eye for any reasons that nesting has been low. No matter what happens, we will have lots of exciting things to share with you as the season goes along, and we’ll be updating the site regularly once we get started with patrols. Hope you will follow along with us! Please share our page with any turtle enthusiasts you know and if you are local in St. Croix, and are interested in volunteering, please email us! SandyPoint.Leatherbacks@gmail.com. We would love to have you join us! We’ll hold a volunteer meeting during March so you can become acquainted with us and the program. Thanks for your interest in our project! Happy New Year!